When I picked my second-grade twins up from school yesterday, their teacher (also a friend of mine), tearfully told me about this book she had just finished reading to the class, and she urged me to take it home and read it, so I did. Young Trisha has a learning disability and is the target of teasing and bullying. She longs to go live with her dad and grandma in Michigan and make a fresh start, where nobody will know how dumb she is. In Michigan, however, she is bewildered and crushed to find herself in a “special” class, just like in California where she lived with her mom. “Genius is neither learned nor acquired. … and tells them that this describes each of them. And thus follows an uplifting narrative about how these kids find their own worth, and their own special genius. This story, inspired by the author’s own true-life experiences, is a wonderful parable about diversity, tolerance, and the value of all people, no matter what their differences or limitations might be. I love that my kids’ teacher is sharing these principles in her classroom. 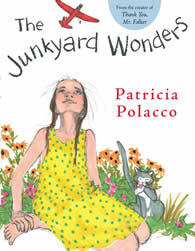 A wonderful story for teachers and parents alike to share with elementary school- age children. Great review Lisa. I loved that definition as well! I would love to find it printed somewhere to hang in the classroom. Perhaps I should get it tattooed on my back?